The 2016 NAAA Convention & Exposition celebrated it’s 50th anniversary December 5-8, 2016, in Long Beach, CA. There have been many changes in the industry since the National Agricultural Aviation Associated was formed in 1966! For over fifty years, NAAA has supported small businesses and pilots who use aircraft to improve food, fiber, biofuel, and protect forestry. Below is a quick look at some of the more interesting innovations that have occurred since NAAA was first formed. 1969 Boeing 747 conducts first flight. 1976 Concorde SST introduced into commercial airline service. 1986 Voyager, flown by Jeana Yeager, circumnavigates the globe on single load of fuel. 1990s B-2 bomber developed by Northrop Grumman. 1995 Boeing introduces 777, the first aircraft produced through computer-aided design. RF System Lab would like to congratulate NAAA on fifty years of working on behalf of its members. At this year’s convention, at the Long Beach Convention Center, Borescope Expert, Zack Wessels, was on hand to demonstrate the VJ-Advance (VJ-ADV) video borescope, used in a variety of aviation maintenance inspections. 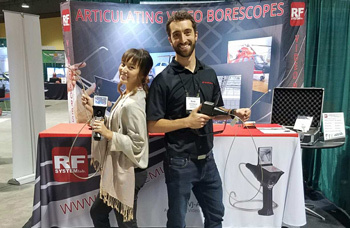 If you were unable to test out the VJ-Advance video borescope at RF System Lab’s booth during the NAAA convention, we’d like to offer you a chance to try out the VJ-Advance at your own facility — for free! Click here to learn more about our no-cost, no-obligation demo program, or call 231-943-1171 to speak with one of our borescope experts about your remote visual inspection needs.